Power and dependence: The engine of network formation? Theoretical models of network formation usually involve the following: network self-organization (e.g., reciprocity, transitivity, etc. ), actor attributes (e.g., popularity, homophily, heterophily, etc. ), exogenous contextual factors (e.g., natural environment, geographic propinquity, entrainment, etc. ), or some combination of all three to explain network structure. In the present research program, we employ actor attributes found in the social exchange literature - power and dependence in particular - and exogenous contextual factors - geographic propinquity - to account for the formation and structure of a social network. To test the robustness of these local processes, we draw on a population of cooperatively competing actors who are driven by status and proximity in their determination of when and with whom to compete. With exponential random graph models and other modeling techniques, we find strong support for both local processes. ​Robbins, Blaine, Howard T. Welser, Maria Grigoryeva, and Eric Gleave. 2014. 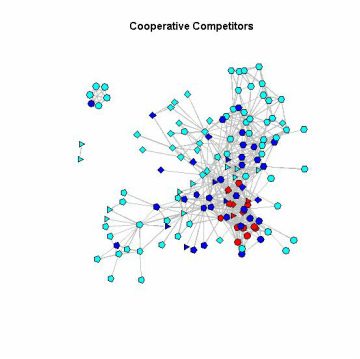 "Power-Use in Cooperative Competition: A Power-Dependence Model an Empirical Test of Network Structure and Geographic Mobility." Social Science Research 45: 131-151. 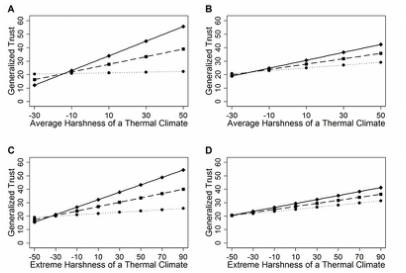 Does thermal climate reduce generalized trust? Individuals vary widely within and across countries with respect to their personality traits, such as happiness and life satisfaction, self-efficacy, and social identity. Recent theories within cross-cultural psychology suggest that climatic demands - harsh weather conditions - in conjunction with wealth-based resources account for these cross-national variations in personality traits, including variations in generalized trust. The current project tests this proposition with the largest known longitudinal data set of generalized trust and finds strong support for the hypothesis. ​Robbins, Blaine. 2015. "Climate, Affluence, and Trust: Revisiting Climatoeconomic Models of Generalized Trust with Cross-National Longitudinal Data, 1981-2009." Journal of Cross-Cultural Psychology 46: 277-289. Political institutions and generalized trust: A causal force or farce? One area of my research centers on understanding the relationship between political institutions and generalized trust. This work broadly addresses the issue of whether apparatuses of the state, such as regulation of business, credit, and labor markets, undermines or promotes beliefs about the trustworthiness of strangers - what is commonly referred to as generalized trust. In this research, I've shown that the association between political institutions and generalized trust is a dynamic one, often involving complex conditional relationships, temporal associations, and reciprocal causation. For a detailed discussion of these findings, see the publications below. Thanks to Jacob Young for the title...well...at least the last part. Robbins, Blaine. 2012. “Institutional Quality and Generalized Trust: A Nonrecursive Causal Model.” Social Indicators Research 107: 235-258. Robbins, Blaine. 2012. “A Blessing and a Curse? Political Institutions in the Growth and Decay of Generalized Trust: A Cross-National Panel Analysis, 1980-2009.” PLoS ONE 7(4): e35120. Corrigendum: model specifications. Gleave, Eric, Blaine Robbins, and Beth Kolko. 2012. “Trust in Uzbekistan.” International Political Science Review 33: 209-229. Robbins, Blaine. 2011. “Neither Government nor Community Alone: A Test of State-Centered Models of Generalized Trust.” Rationality and Society 23: 304-346. Robbins, Blaine and Maria Grigoryeva. 2010. “Information Technology, Political Institutions, and Generalized Trust: An Empirical Assessment Using Structural Equation Models.” International Journal of Dependable and Trustworthy Information Systems 1(2): 55-69. I've played the sport of Ultimate on and off for a number of years. From 2002-2009, I played for an Ultimate team known as Seattle Sockeye. During portions of my tenure on the team, I engaged in an ethnographic research program to better understand the scope and applicability of self-governance, which is central to how the sport resolves conflict and maintains social order during competition. I found that Ultimate teams and players in the community employ a wide-range of informal social control mechanisms to reduce opportunism, including self-discipline, social norms and sanctions, reputations, and social selection. Robbins, Blaine. 2012. “Playing with Fire, Competing with Spirit: Cooperation in the Sport of Ultimate.” Sociological Spectrum 32: 270-290. Robbins, Blaine. 2004. “‘That’s Cheap.’ The Rational Invocation of Norms, Practices, and an Ethos in Ultimate Frisbee.” Journal of Sport and Social Issues 28: 314-337. Another area of my research explores the contextual sources of crime and justice. This line of research attempts to address a classic question: To what extent do elements of culture - beliefs, preferences, and constraints - impact cooperation? From this, we might abstract a number of more specific, operational questions: Do variations in religious beliefs or religious orientations across cultures differentially impact rates of homicide? Do non-religious beliefs, such as generalized trust, play a part in explaining intentional homicide rates across countries? Papers addressing these topics are listed below. Corcoran, Katie, David Pettinicchio, and Blaine Robbins. 2018. “A Double-Edged Sword: The Countervailing Effects of Religion on Cross-National Crime.” Social Science Quarterly 99: 377-389. Robbins, Blaine. 2013. "Cooperation without Culture? The Null Effect of Generalized Trust on Intentional Homicide: A Cross-National Panel Analysis, 1995-2009." PLoS ONE 8 (3): e59511. Corcoran, Katie, David Pettinicchio, and Blaine Robbins. 2012. “Religion and the Acceptability of White-Collar Crime: A Cross-National Analysis.” Journal for the Scientific Study of Religion 51: 542-567. Robbins, Blaine and David Pettinicchio. 2012. “Social Capital, Economic Development, and Homicide: A Cross-National Investigation.” Social Indicators Research 105: 519-540. Crutchfield, Robert D., David Pettinicchio, and Blaine Robbins. 2012. “Cultures of Inequality, Threat, and Imprisonment.” Pp. 31-52 in Pascale Antolin & Arnaud Schmitt (eds. ), Pratiques et Esthétique de la Déviance en Amérique du Nord. Pessac: University of Bordeaux Press.